AM - TM: 8mi. ctdwn - started at 9mph and increased evry 5 minutes. @nd 30 minutes switched to continuous interval setting - alternated AT/TH up to 10.4 mph. 51:15. WU/CD easy miles. AM - TM Long run: early start at gym A couple restarts and 3 gels eaten. 23 miles, hopped off and did 15 minutes of foam rolling, got bakc on and went 30 minutes moderate cutdown and finished out the 30. 30 miles total - 4:29:30. Watched a lot of English Premier League Soccer. Pmiles easy divided between 2 TM runs. Lunch - 1 hour strength training session. AM - TM walking - 2.4 miles. Lunch - 4.3 miles in the great outdoors - 34:20. Very windy but temps above 40 are hard to resist. AM - TM walking - 2mi. Lunch - Run outside - Bridge Hills on Burkhart. 1.5 miles Pickup on TM before the 1 hour strength and circuit session. More core and leg strengthening exercises. Jog back to office afterward. 5.7 miles total. 3.84 miles run from house to Sub Unit. Forgot I had my laptop at home, so I got to secure and carry that on my back. 34:01. Taking it easy for trail race (5miler) and a long run on following day. Today is the wife's birthday. 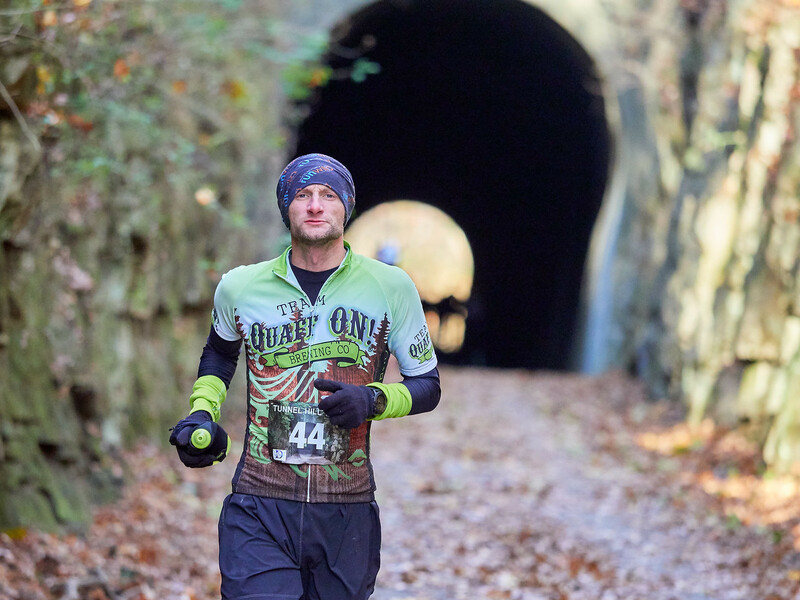 So I went and ran a race in Brown Co. State PArk. Frosty 5miler: WU on trails where race course was - very muddy and wet. Raining during the race. about 30 degrees and pretty miserable if you weren't running. Fun times - ran with Danny Webb and Christian Wagner for part of it, and thy put the pedal down in the end and left me. Lots of elevation gain for a 4.9 mile race -- 656 feet. Ran 36:41 and felt pretty strong for a fifth place finish. Last Long LR before Rocky Rac. 100. Went to the TM at gym in Columbus. Clocked in around 7:30, and did my usual routine. fill up water and eating gels every hour (TM resets). Ate 5 gels, drank fair amount of water, and stopped for a couple of bathroom breaks. took in 2 EP matches. 35.8 miles - 5:18. Feeling trong throughout but struggled with some minor GI issues. Lunch run before gym: 2 miles - 20:42. 45 minutes of strength training. Did pullups, lots of core and squats, lunges, etc. today. Really convinced that these sessions are really beneficial. The last long run on Sunday was different - felt stronger at the end, when I have been struggling. AM: gym TM run - 20 minutes alt. 0.25mi. varied between AT and TH effort. Got up to 10.7 mph. 5 miles total - 36:20. AM TM at gym - 4 miles - about 35 min. Sweatin profusely. PM: 27 mi. Long Run - 4:05. Barely Ultra. 60 degrees and sunny today. Sun's Out / Gun's Out (I ran outside). Ran out and back on People Trails. Lot of rain here recently, so some interesting flooding scenary. The paved People Trail runs along the River and one fothe main larger Creeks in the area. Struggle mode at the end (last 4miles). It was probably good to get this one outside and remember the difference sun and wind make. 4 gels eaten, filled up hand held once. 12-14 next weekend, and then 100mile attempt No. 2 in TX. followed w/ 1hour strength and conditioning - mostly lunge and squat circuit type training. Lunch TM run - 30min. ctdwn - got up to 10.4 mph. 5.2 miles - 36:40. AM - TM walk jog for 5miles. about 9:30 pace. Off - feeling tired and beat up. Start thinking taper mode. Off Running - Did 1 hour Strength/Conditioning session at lunch, but, feeling sick. Achy and coughing. Great - I am definitely sick. Bad lung coughing, and running a fever. Unbelievable. Laying in bed all day today feeling achy and feverish. Temp. was 103 when my wife put the thermometer under my armpit. TM walking. Feel Like. Crap. Noticeable improvement. Burning lungs still.